SOLID STATE LOGIC XL9000 K Computer 64 Channels 'G' & 'E' eq switchable. and Total Recall 5.1 Mixing direct control of all digital recording systems, protools, radar , etc. Studio One live room Note: the sound was so good in Studio 1 we didn't dare update the decor! Bosendorfer Grand Piano (Included in Rate) with midi out. Extras (Extra charges) Extra Protools in/outs Logic Audio Radar. Sync to Video . . also Any piece of equipment available on hire... .....within the hour!! 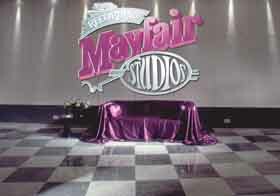 All photos and registered trademarks appearing on this site are the property of John Hudson Mayfair.